From right: Harald Roesch, CEO at Melita, David Darmanin from Hotjar, Ben Remfrey from Praedium Consulting and Ron Attard, EY Malta managing partner. 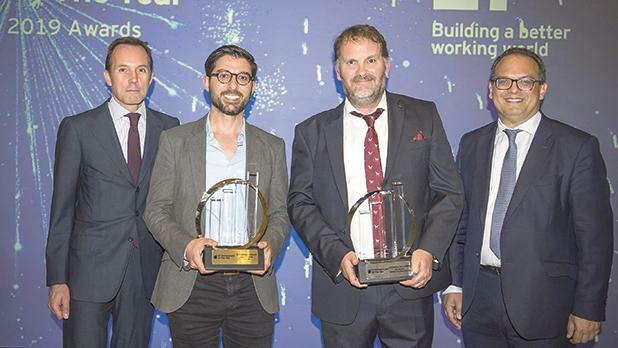 David Darmanin, the founder and CEO of Hotjar, a business which helps website owners understand user behaviour and optimise conversions, has won the third edition of EY’s Malta Entrepreneur of the Year award. This June, he will travel to Monaco to represent Malta and compete in EY’s World Entrepreneur of the Year award together with business leaders from more than 60 countries. Ben Remfrey, managing director at Praedium Consulting Limited, specialists in training NGOs and governments to clear mines following armed conflict, has won EY’s Rising Star award, sponsored by Melita Limited, and will also be attending the Monaco event in June. In 2019, for the first time, an additional Lifetime Achievement Award was also presented. This year’s recipient is Carmelo Debono, who since the 1960s has built Maypole, to become one of Malta’s leading baked goods brand. EY has been holding the Entrepreneur of the Year awards on a global basis for three decades. Now spread to more than 60 countries, they have created a global network of 50,000 entrepreneurs and are the global benchmark for capturing today’s and tomorrow’s entrepreneurial spirit. Over half of today’s top 100 NASDAQ companies have won EY’s Entrepreneur of the Year award, and most received the award before they achieved top 100 status.